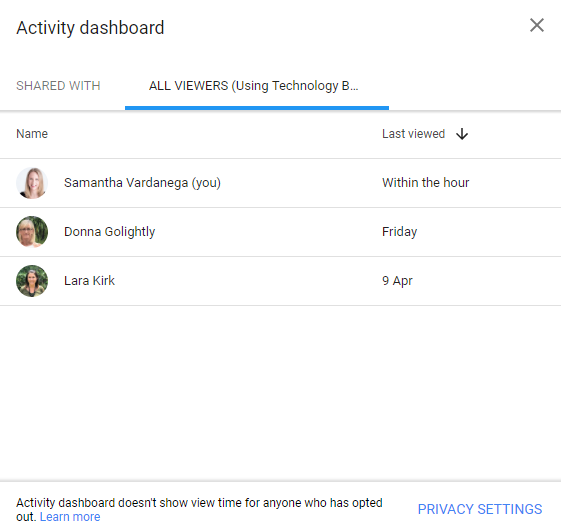 The new Activity Dashboard feature in Google Docs, Sheets and Slides lets you see who has viewed a file, and when they last viewed it. In this blog post, I’ll show you how the feature works and how you can configure the related privacy settings. Note: This feature is only available for those with a G Suite account, not a regular consumer Google account. However, those with G Suite accounts can see the view activity of people using regular consumer Google accounts (or people in other G Suite domains), so long as the file has been explicitly shared with them. 1. 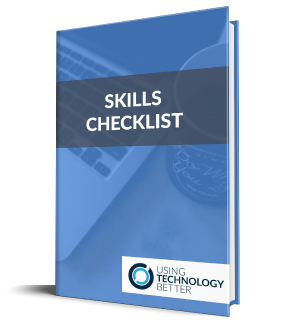 Open the Google Doc, Sheet or Slide that you want to view activity for. 2. Select the Tools menu > Activity Dashboard. 3. The viewing history of each person the file is shared with is displayed on the Shared with tab. People who have a dash next to their name either have not viewed the file or have opted out of having their view activity shown (more on this soon). 4. 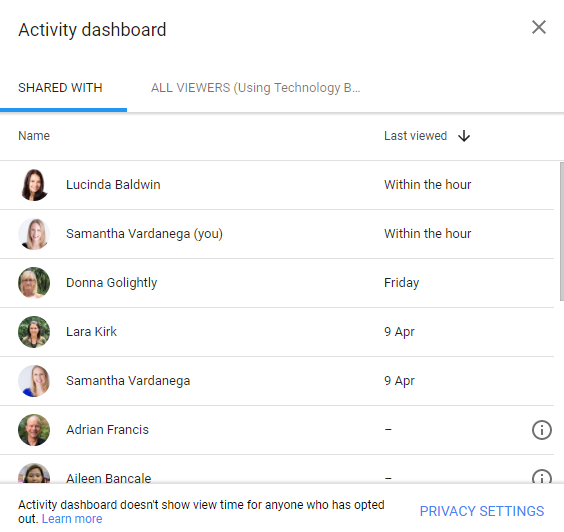 The All viewers tab shows a list of everyone within your own G Suite environment who has viewed the file (except those who have opted out). You can choose to turn off history viewing for either one specific file or for all files. This means that your view history will not be visible in the Activity Dashboard. 1. 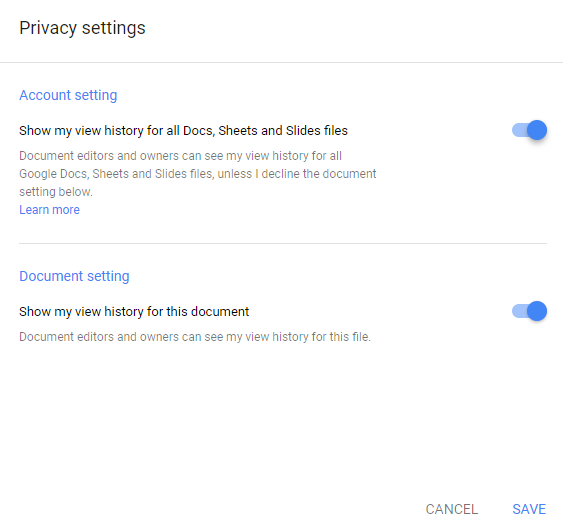 Open the Google Docs, Sheet or Slide that you want to hide view activity for (or any Doc, Sheet or Slide if you want to hide it for all files). 4. Toggle on/off each setting as required. 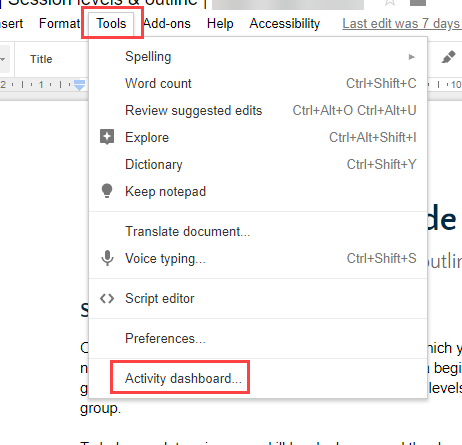 The Activity Dashboard is a useful way to see who has accessed a shared document. However, due to the opt-out feature, it can also not be regarded as an absolute truth! If you want to remind people to view or contribute to a shared document, try using the Email collaborators feature to send them a quick reminder. This email also includes a link to the shared document, in case they’ve lost it! 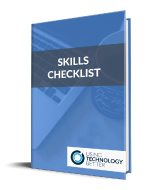 You can find this feature on the File menu in any Google Doc, Sheet or Slide.